Following on from Simon Whitehead’s Lost in Ladywood project, MADE (Midlands Architecture and the Designed Environment) wanted to explore the potential to apply Simon’s process to other places in the West Midlands, as part of a project to explore how creative people and local residents could work together to contribute to the planning process. MADE commissioned three artists and a horticulturalist in the West Midlands to develop a walk with local people, which explored local distinctiveness and ‘Sense of Place’. The four linked projects were to result in four ‘alternative guidebooks’ to Dudley, Market Drayton, Rugby and Tamworth. The guidebooks were loosely based on the format of Lost in Ladywood, creating the beginning of a series which MADE (and Papergecko) hope to extend further in the future. Working within the prescribed structure, and initially with Simon Whitehead’s input, we worked closely with the four ‘guides’ to put together publications which reflected a range of approaches to the project brief. Pamela Smith, a horticulturalist, developed a fascinating walk around Market Drayton, focussing on the flora to be found in every nook and cranny. 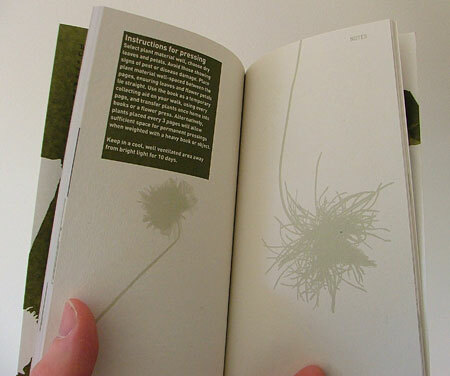 To give the accompanying guidebook an additional use, we suggested including a series of blank blotting paper pages which the reader could use to collect their own botanical samples (after reading Pam’s guide to respectfully collecting plants). Claire Wood, an artist based in Tamworth, worked with young people, creating a route which led the walker around some of the young people’s favourite places, and gave an insight into how those young people experience their urban environment, and how it could be improved. The intention of this guidebook was to use it in an education context, so we added an extra section of cartridge paper for notes and drawings. In Rugby, artist Eric Gaskell had worked with local people to examine the skyline of the town, developing a ‘walk through the town, looking up’. 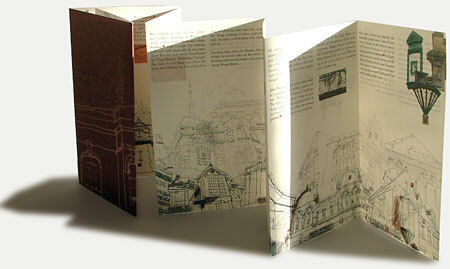 This publication comprised a concertina fold-out featuring a finely detailed drawing by Eric of the rooftop landscape. Finally, artist Gerard Mermoz took ‘A Critical Path’ through the market town of Dudley, using the initial public walk as an opportunity to examine ‘what could be done to better serve the needs of the people who live or work [there]. As with Eric’s Rugby guide, Gerard opted for a concertina folded publication, the expandable format serving as a metaphor for Gerard’s situationist derive. All the Making Sense of Places publications are available on Amazon (see below). MADE have also commissioned a website specifically for the Making Sense of Places Project. Dudley: A Critical Path by Gerard Mermoz. Market Drayton: A walk in the company of a Horticulturalist by Pamela Smith. Rugby: A walk through the town, looking up by Eric Gaskell. Tamworth: A walk in the company of Young People by Claire Wood. Paperback: 42 pages.